If you open my refrigerator door, you will see lots of fresh vegetables, skim milk, a large jar of yeast—and about 10 dozen eggs. See, my 12 hens have not taken the winter season for a holiday. They keep laying and laying and laying. The weekly menu on our refrigerator reads something like this: red pepper quiche, goat cheese and spinach soufflé, broccoli quiche. Dessert is crème brûlée. Now, I am finally doing something about all these eggs besides just eating them! 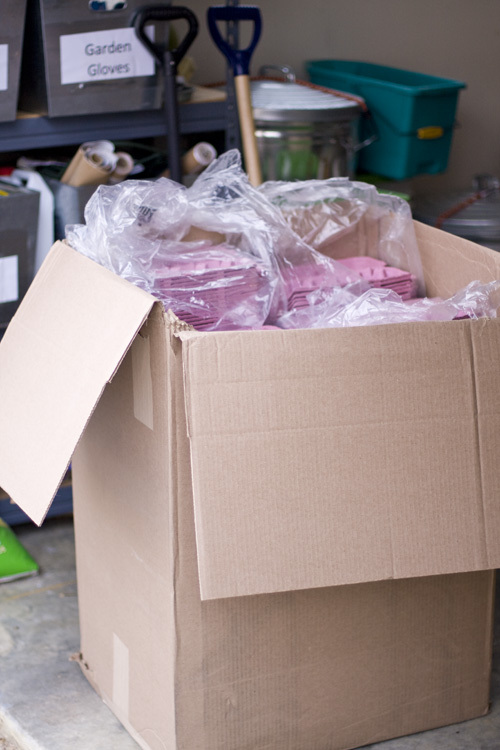 I ordered 250 egg cartons—in a bright pink that, it turns out, somewhat resembles the rather lurid color of Pepto Bismol. I applied for and received my egg distributor certificate from the State of Maryland. This week I’ll check in with the county health department about local regulations. All of this so I can give the eggs away! I only have 12 laying hens (only! ), so it isn’t practical to think I can sell them. My plan is to identify church and community groups that can take about four or five dozen eggs off my hands each week. So, you see, my hens and I have a joint volunteer project! So that’s what you do with too much of a good thing! Great thing you are doing! Even though it may be Pepto pink, I like it better than gray. Kudos to you for creativity and resourcefulness. Has anyone told you lately you rock? What a nice thing for you to do. I don’y have chickens any more because I don’t have the time or energy to take care of them, but I dearly miss their sweet little noises. Luckily, my husband has a co-worker who has chickend and he sells us fresh eggs every week. I love it… great post. Wow, that sounds like alot of work! I was planning on selling eggs this summer, and I’m here in Maryland, too. You’ll have to keep us posted on how it goes with the health dept! 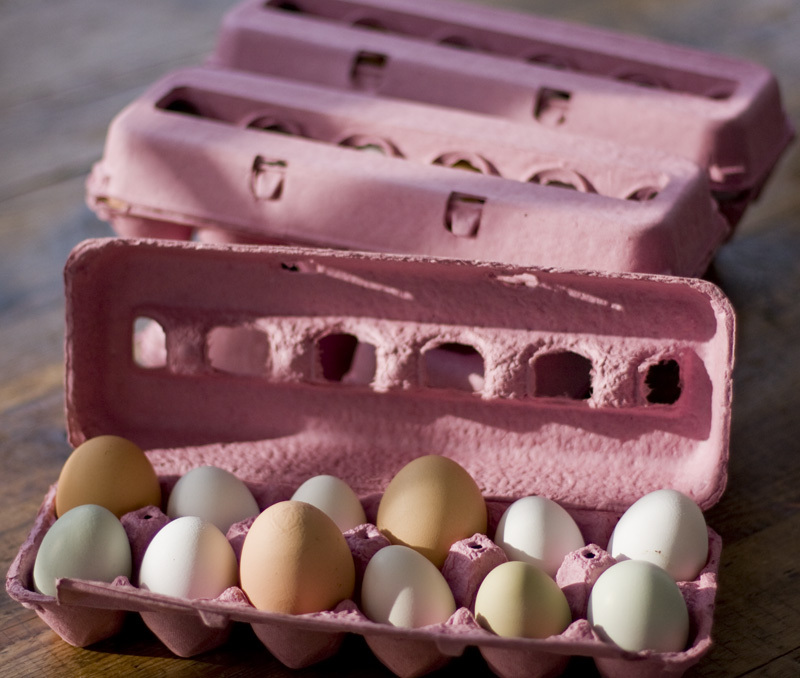 The pink of the cartons really doesn’t do justice to the beautiful varied shades of the eggs. Those groups are so fortunate to be the recipients of your excess (eggess?). .-= Mr. McGregor’s Daughter´s last blog ..Picture This – Winter Light =-. That’s a great idea, but it’s a shame it requires so much effort to do a good deed. I realize that regulations are necessary, but sometimes they seem to be burdensome. Hope your local health department’s aren’t. .-= Judy Lowe/Diggin’ It´s last blog ..Grow your own birdseed and save money =-. Great idea Robin. I think it is a write off but then again, not much of one. .-= Layanee´s last blog ..Wordless Wednesday – February 24, 2010 =-. I just found this article in the Globe and Mail about the “egg police” and the gray market for eggs from free-range hens. Retail price there is $5 dozen. .-= Judy Lowe/Diggin’ It´s last blog ..Moosewood tree glows in the winter landscape =-. Your eggs (or rather, their eggs!) are beautiful. I love the cartons in spite of their color and think you have a really big heart to do this for folks who wouldn’t otherwise be able to enjoy such a treat. In the words of my 7-year old, you will be filling someone’s bucket every week. .-= Diana´s last blog ..Snow sneaks in under the Spring wire… =-. .-= Karen´s last blog ..February =-. Oh, how I wish I lived nearby. I would love to buy fresh eggs. Well, your hen for eggs has certainly been a very successful venture! I also admire you desire to donate them-I cringe whenever I read about gardeners composting the vegetables they cannot eat-when there are lots of hungry/needy people. .-= Nicole´s last blog ..Trinidad Carnival 2010 =-. My chickens are not quite as devoted to duty as yours, but things are starting to pick up. I give some of my eggs away to neighbors and friends (never thinking the state would need to certify me in some way) and I gave away a lot of eggs to the local food pantry last year because I had so few vegetables to donate as part of Plant a Row for the Hungry. Yep, if I was anywhere close, I’d be begging for your eggs. I buy them at the farmer’s market in the summer, and pay through the nose for organic ones in the winter at the grocery store. Sigh. Think of the pink cartons as supporting breast cancer, not Pepto Bismol. .-= Ann´s last blog ..The Weather Here, and Thus, More Travelogue =-. I tell everyone at church to bring an egg carton and I will fill it for them. They stay pretty much cleared out and even have someone to take my duck eggs now too. I live in a small town so word gets around pretty quick. 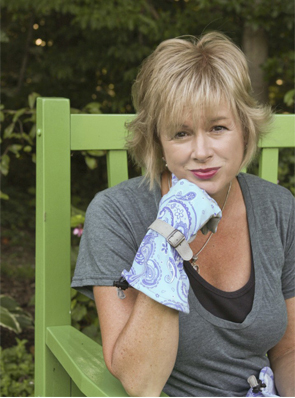 .-= Debra Howard´s last blog ..Spring Time Blooms =-. Hi! 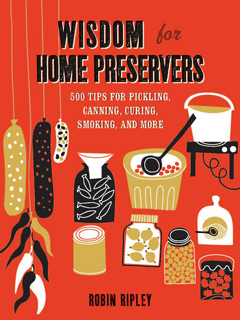 I'm Robin Ripley author of Wisdom for Home Preservers, published by Taunton Press. I am also co-author of Grocery Gardening. Bumblebee is about my life in rural Maryland, my garden and my love of food, my little dogs and pet chickens. You can follow me on Twitter, Pinterest and Facebook. Thank you for visiting! To get the latest Bumblebee posts in your email box, just enter your email address.